An unorganized medical cart reduces treatment time and increases frustration. Building necessary habits to keep your medical cart organized is vital to maintaining a happy working environment. How your medical cart is organized depends on what its primary function will be. Administering IV’s or medications, Anesthesia, emergencies and checking in on patients all require ease of access to different supplies. An organized medical cart is also vital to maintain a sanitary environment. If supplies are mixed or improperly disposed of, infections may spread to additional areas of your medical facility. Keep large equipment like oxygen tanks, and portable defibrillators/monitors on the outside of your cart. This allows for easy access to items used often. Carts also have additional options of adding different medical cart organizers like placing a basket on the outside of your cart, so larger items do not take up additional space. Probably one of the most important and easiest places to become disorganized, medical cart drawers should be the first thing you arrange. Keep frequently used supplies in the same drawer to reduce time opening and closing compartments. Separating drawers depending on function will also improve your ability to treat patients rapidly. For example, keep all pediatric supplies in one compartment so during an emergency you know exactly where they are stored. Use a medical cart organizer like drawer separators to guarantee items do not intertwine during transportation. The last thing you want to happen during treatment is to open a drawer and find that what you need is out-of-stock. Before every shift, go through your supplies and check you have everything you need. One way to guarantee that you do not run out of supplies is to restock items at the end of every shift. Medical carts on wheels with drawers are on average shared between medical professionals. Unless you work in a smaller facility and are able to have an individual cart, it can be hard to maintain an organized cart with multiple users. Label clearly every drawer with what they should contain so your employees have a clear organizational guideline to follow. Using labels also reduces confusion and time spent searching for supplies. Providing a checklist as a medical cart organizer allows different medical professionals to see what items need to be re-stocked and are stored on each cart. When creating your checklist, make sure to write the expiration date next to all medications. That way when it is time to stock items a medical practitioner can easily replace outdated medications without needing to look at every container. Clearly identify where hazardous supplies should be stored on medical carts on wheels with drawers. Typically, you would store them in a lower drawer with dual-locking capabilities. On-board sharps or trash containers are an important component to add to your medical cart. Storing these objects in an additional storage component within a drawer double safeguards patients and employees from interacting with needs or contaminated supplies. Remember there are a variety of additional medical carts organizers available in today’s market. 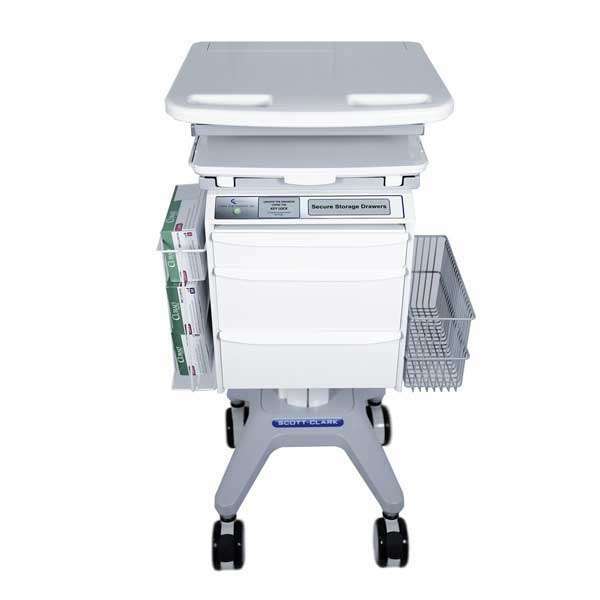 Assess what your needs are and purchase additional medical cart organizer items to make your job easier.